How Has The Union Budget 2015 Impacted The Real Estate? 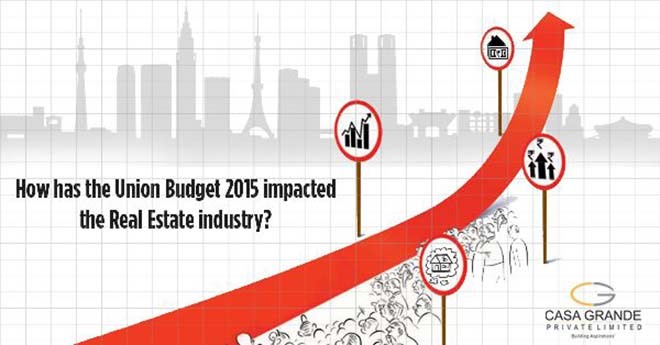 How Has The Union Budget 2015 Impacted The Real Estate Industry? This year’s budget announced by the Finance Minister Arun Jaitley, aimed at high growth by seeking an increase in investment and benefits for ordinary people. The various provisions suggested in the budget gives the common man an accumulative savings up to Rs. 4.44 lakhs, given a certain extent of investments into personal and health insurance. There has been no deduction in the tax limit or compensation on housing loans. The fact that the schemes on this front have been unchanged is a disappointment to say the least as there was a lot of expectation for an increase in both these limits. Here are a few important aspects of the budget that have affected the Real Estate Industry. Real Estate Investment Trusts (REITs): In a boost to the realty sector, the capital gain tax regime for sponsors of REITs has been rationalized which will now help channelize both foreign and domestic funds into real estate and infrastructure. The tax incentives in this field would come as a much needed relief as the real estate sector has faced a huge slowdown in demand in the last few years. Benami Transaction Bill: This bill is probably the government’s next big step in curbing black money in the property market. According to this bill acceptance of more than Rs. 20,000 in cash is prohibited for property deals. This way the budget has incentivized the use of wired money rather than cash transaction which will in a great way help bring transparency. ‘Housing for All’ Scheme: The budget announced the allocation of 14,000 crores for the ‘Housing for All’ scheme that aims at building 6 crore houses by the year 2022. However, there were no specific details regarding the project locations, elaborate timelines, funding. Tourism and Hospitality Real Estate: The Visa on Arrival program which was only available for 43 countries previously has now been increased to cover more than 150 countries which will lead to a surge in tourism and improve the destination retail in the country. Smart cities: There were no details provided in the budget regarding the construction of the 100 smart cities that the government had proposed. It is still unclear as to how the government will take this initiative forward and the cities that have been targeted. However, other aspects of the budget such as increased allocations to infrastructure development, better access to education and the digital India initiative indicate a specified plan towards the construction of these smart cities.